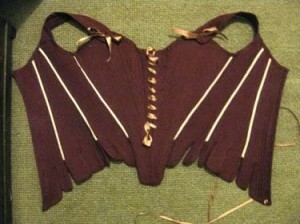 The stays were based on the 1750s stay pattern from Jill Salen’s Corsets: Historical Patterns and Techniques. Heavy cotton fabric in muted red, tea-dyed trim, plastic whalebone (cable ties) and german plastic boning. The toile and cutting the fabric. A review and discussion on dating the stays. A review of the stays. The stays over a shift. 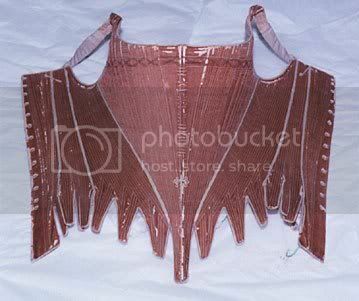 Wearing the stays under a robe a la francaise.